The community has also demanded GFM broadcast more than once each year. The level of expectation was immense. However, we went about delivering what the community wanted. First step was to raise the funds. We were very fortunate one of the major sponsors of 2002 Lincoln Financial Group had indicated that it would consider another application from GFM. Also, Community Counts was prepared to do the same, but they would only match fund. There was a sense of nervousness from each organisation because the equipment had been stolen in 2002 and they were reluctant to fund GFM until they were assured there would be adequate insurance in place before funds would be released. Simple as it seems, getting insurance was again going to be extremely difficult. 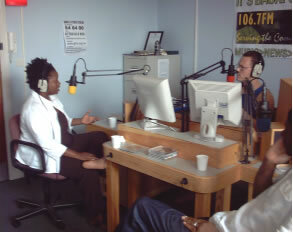 However, community radio is about the community developing links with other organisation doing more or less the same thing. We are grateful to Roger Druary over at The Forest of Dean Radio for pointing us in the right direction to secure the necessary insurance required. With insurance in place we were able to secure the funds to purchase the Studio and IT equipment. Unfortunately, we did not secure enough funds to purchase the transmitter equipment, which meant we were unable to progress to broadcasting twice a year. We were delighted when it was confirmed GFM had been granted another restricted service licensee by the radio authority in the December 2002. We had six months to raise the funds and we were able to approach potential sponsors with confidence. With the help of Howard Francis and the staff of BTD we were able to sort out purchasing the studio equipment. We were again pointed in the right direction by Roger Druary when selecting whom to ask to provide quotes for the studio and transmitter equipment, we eventually settled on Studiocare, the same company that had supplied the Forest of Dean Radio with their radio broadcasting equipment. 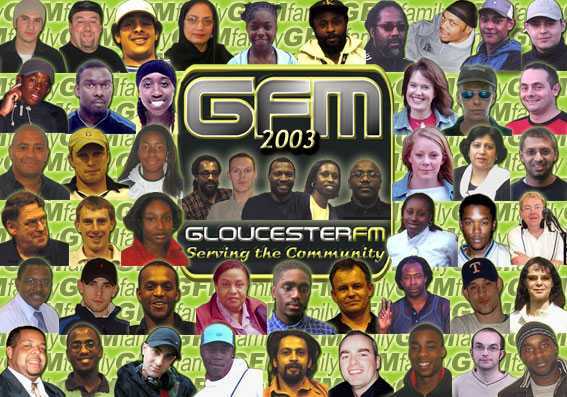 The number of people involved with GFM continues to grow each broadcast. This year there were a total of forty-six people. Thirty-four presenters, six community link crew, four management committee, one responsible for the website and one responsible for the webcasting. This year there were eighteen people from the age of fifteen to twenty five and the rest from twenty-five upwards. Since the start of GFM five of our young people from the community link crew have gone onto university. Furthermore, we are of the opinion we are a good example of equal opportunity with our presenters reflecting the community we live in. We had hoped to set up a web camera to enable our community to see us in action, but we might have been too ambitious in wanting to do to many things, therefore this never materialised. However, we will endeavour to have this up and running for future broadcast. Through out our broadcasting life we have always wanted to put something together in writing for presenters to refer to for guidance when in the studio on their own. However, we had not been able to get this done for one reason or another. When someone is invited to become a presenter on GFM he / she is encouraged through capacity building. Building up confidence and coupling it with training we‘ve found it to have been particularly helpful to presenters who have no experience in broadcasting and have progressed from shadowing a presenter to presenting their own show. But, there was still no written manual to refer to, as it is not always possible to have someone on hand to support everyone as and when support is requested. Setting up our own training manual, we hoped would be another means of giving additional support. This was not going be an easy task, however we have progressed to almost completion. My gratitude goes out to JJ Watkins, Martin Rafferty and John Mustoe for the help in putting together something that the presenters were able use during the broadcast. The manual includes diagrams of the various IT functions and written information for using most of the equipment. When it is completed it will include a drawing of the main mixing desk currently being done by Vere Richards that will identify each button and indicate what it’s function is. Training is a very important part of GFM’s future development and it is imperative that we continue to improve this to help new and existing presenters that should help their confidence and capacity when delivering, music, news information and advice. With GFM now owning its studio equipment, it is envisaged there can be live training broadcasts on the Internet through out the time we are not broadcasting on the radio airwaves, culminating with the live broadcasts of the radio. We were once again able to offer the five-day Open College Net work accredited radio production training to fifteen new presenters who joined GFM for this years broadcast. The training schedule has been discussed and agreed previously with Kevin Philemon. And, again delivered by our partners CEED, Multi Media Centre, Bristol. We were delighted that this year Gloucester Crime and Reduction Partnership and one of our new partners for this broadcast, Gloucestershire Housing Association, sponsored the training. GFM’s own in house training team once again worked hard to train new and existing presenters on using the new equipment. We provided a new studio email address for the community to interact with us direct to the studio, a new Text line number and a new telephone number that was much easier for the community to remember. Interacting with the community live on air is very important to GFM, because it gives the community the opportunity to have it’s say on what it likes, what it does not like and give ideas on the way forward. Unfortunately, for us introducing so many new things worked against us. It meant presenters were not able to monitor the number of emails, telephone calls and text messages to the studio as well as present their shows. This year also saw us use for the first time the Enco Dad 32 pro IT system. This was a trail and error situation, despite getting training from Enco Systems, not everyone felt comfortable with using the system and this needs to be developed more in future and more training has been identified as required. I am already taking steps to rectify our shortfalls using the new equipment. It was difficult for the in house team to comprehend the various functions of the IT system, the new equipment and then train others as well. However, they all did very well. Since the broadcast we have set up an IT working group. It is hoped they will become fully trained by Enco Systems on using the IT equipment and will be able offer better training to new and existing presenters. Furthermore, we intend to do training broadcast on the Internet. These training broadcasts should not have the pressures of the FM broadcasts, although it will be live on the internet, there should not be the distractions of answering the phone, reading texts and emails messages etc. Developing training is of the utmost importance and we will be seeking the funds to enhance this more. I will once again try and enter into some form of partnership with colleges in the Gloucestershire area that will benefit them and their students and GFM in the future. Most of our new presenters were able to use the training they had received to present their respective programmes. For some it was no easy task, for some it was learning as they went on, for some they took to it straight away. 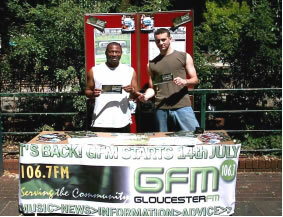 The Gloucester Festival started on Saturday 12 July and GFM had already started promoting the festival to its listeners prior to the start date. The date was on our printed publicity and information about the festival was on our website. The carnival procession was colourful and the day was really like carnival, it was hot. Dan Robertson (Callide), Mark Davies (DJ Deigo), Adam Thomas and I manned the GFM stall in Kings Walk, thanks guys. Dan and I dismantled the stall and walked to the park to set up the stall again in time for the finally and see all the floats enter the park. 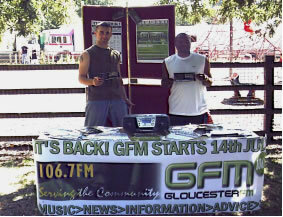 The GFM stall was well attended in Kings Walk and Gloucester Park. Dan Robertson did a wonderful job on posters and we had a Gloucester FM banner 2.6m x 1.2m on the stall. It was heart warming to know so many people already knew when GFM would be on air. Our thanks go out to the Chelsea Building Society for the printed publicity and the Citizen newspaper for the articles on the GFM leading up to the broadcast. We were live on air Monday 14 July and the weather was getting hot, even hotter in the studio. This year’s festival was the first time we would be broadcasting without the former festival organiser Jon Hogan. Unfortunately, our involvement was not what it was in the previous years. We put this down to the new festival organiser Mhairi Smith not knowing how closely GFM had worked with the city council to get our multi cultural community to support the festival following a very visible lack of support in the past. However, we’re pleased that there was a dance tent in the park that hosted some of GFM’s younger presenters. The event was success, however we had hoped to have more of an input in the event. During the festival we managed to interview Mhairi Smith the new festival organiser for Gloucester who was extremely busy during the festival, so we were pleased when she came on the community link show. The broadcast so far has coincided with the summer being hot which has brought about a sense of togetherness through out the community. It was particularly pleasing to get good response from our community on the new shows that were broadcast on GFM that were different from previous broadcasts. In particular, our new presenter Dino Samura introduced African Beats to the community and the feedback was better than we could have asked for. Dino presented the show in his own unique style that was like a breath of fresh air. television. Our listeners had asked for it and we were delighted with the support, GFM once again serving the community. Another new programme that we hoped would engage more listeners in the community was Smooth Jazz. Joining GFM to present this programme, one of the stalwarts of Gloucester’s local music scene, Rich Edwards. This programme also brought new listeners to GFM. It was the first time for the presenter and the first time we had attempted to offer something a little different and we were delighted with the response we received. We were disappointed that we could not get any of the local nightclubs to work in partnership with GFM and allow us to play the music live to the community, but we will continue to communicate and try and work with local night clubs. Whilst the list of new programmes is not exhaustive, these aforementioned programmes show GFM intends to continue to build on each broadcast and act on the feed back received from the community whenever possible. All our new presenters did very well and we are extremely proud of them. However, we envisage offering more of the different types of music of black origin in future broadcasts if possible. We want to progress to two restricted service licenses broadcast each year, before we can seriously consider applying for an “Access License” as and when it becomes available. By acquiring the studio equipment we are getting nearer to both. We will continue to make the most of the Internet facilities afforded us by the Community Media Association to broadcast. I felt honoured to have been asked to talk at this years Community Media Association’s summer conference in Sheffield about setting up and running a Restricted Service License by the CMA. who are taking part in the Access License trial broadcasts and CAMFM in Dursley who are currently doing RSL’s broadcasts similar to GFM. Overall, the year’s broadcast can be deemed another success for GFM, however we will not become complacent and will continue to work towards ensuring we serve our community by providing more music, more news, and more information and advice. It has become obvious to us other local radio stations are taking notice of us and are attempting to do what we are doing. This is confirmation that we are doing something right. However, GFM is voluntary organisation and is run by local people and is in tune with the local community that it serves and is with the people for the people, therefore we believe we are truly a community radio station. GFM continues to provide information and advice that is receptive to our multi cultural community. 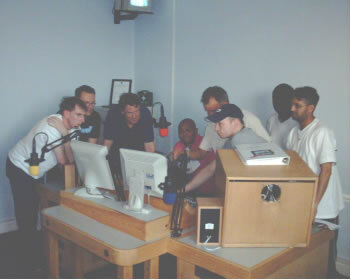 For example, we worked in partnership with Gloucester Prison when making the anti drugs community information adverts. The adverts featured prisoners who were incarcerated for drug’s offences talking about their real live experiences and warning others in the community about the danger of using drugs. Furthermore, GFM also established links with Narcotics Anonymous. A recovering drug addict was interviewed live on GFM and during the interview, he warned of the dangers of drugs and made such a passionate and forthright appeal to listeners who might be involved in drugs to seek help, one could not help but be moved by his emotional plea. Some of the information provided was aimed specifically at our Asian community and has been presented whenever possible in their mother tongues. For example, Bollywood Gossip, Household hints for women, Asian cookery lessons, Social problems and ideas for solutions. We were delighted to high light Mr Salim Kholwadia following receipt of his MBE, Dr Tanvir Ahmed from Gloucestershire Pakistan Social & Cultural Society who talked about the Kids School Club, Poetry and what the community aims to do. And Ms Zahira Nanbawa from Roshni Women’s Centre who gave the community information on what the centre is for and what activities they had planned for the summer, our thanks go out to Nasreen Akhtar, Tahira Haq and Mo Ginwalla. Kingfisher Church and the Bethel United Church of Jesus Christ / Apostolic worked in partnership with GFM and provided us with spiritual and financial support. Our gospel show presenters Vere Richards, Hyacinth Walford and Martin Wallace continue to work with local churches in the community to provide music, news, information and advice that is in my opinion second to none. Indeed, following last years broadcast, Martin Wallace has progressed to presenting his own show on a Saturday, thus offering more diversity for our listeners. 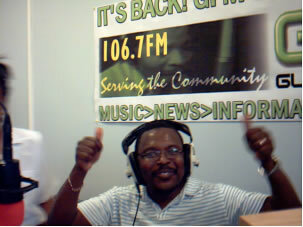 Jamaican Independence day was celebrated on August 6 with Jamaica day on GFM. We went into the community to seek their views on whether or not his should celebrated. The opinions were mixed, some never knew what the celebration was for, some said it should and some disagreed, but in general most people agreed with celebrating Jamaican Independence. Jamaica was granted independence from Britain on August 6 1962. We believe in sharing information about the different cultural celebrations in our community, hopefully, this should help us all to have a better understanding of each other. We were privileged to welcome Jamaican international reggae singer Chevelle Franklyn to the GFM studios on Jamaica day. John Mustoe did an excellent job with the only live interview on radio given by Chevelle Franklyn on Jamaican Independence Day. Parmjit Dhanda, Gloucester’s MP continues to support GFM not only by visiting our studio and taking uestion from the community, but also in parliament by supporting the early day motion for Access License and community media / radio. 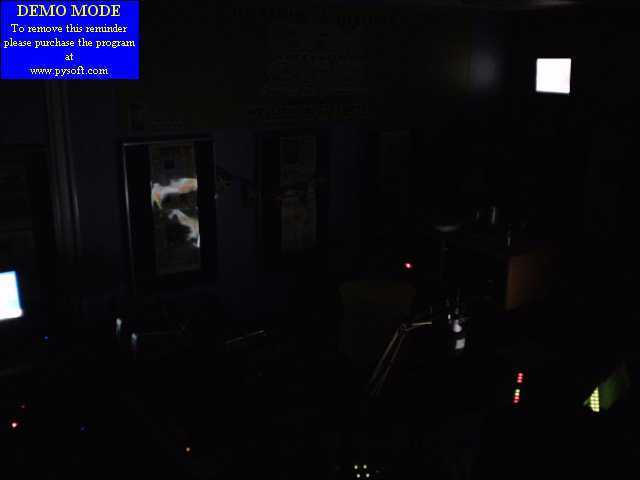 GFM strives to meet most or all of its objectives during each broadcast. We are of the opinion that we have met most of them. Our website has gradually developed into the GFM story and we are extremely grateful for time and input given to us by Andrew Clarke at Spheara Interactive Media. We are also thankful to all our presenters past and present for giving up their time and making the commitment to serve our community and all our listeners for the continued support and comments. 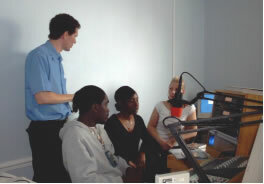 GFM took a positive step forward in 2003 by purchasing the studio and IT equipment. However, unfortunately we were not able to raise the funds to purchase the transmitter equipment, which would make it easier for us to progress to two broadcasts each year. The cost of purchasing the transmitter equipment, running cost and the license fees to run two broadcasts each year is approximately £49.203.00. We have embarked on raising the funds required and we are hopeful large local business / organisations will work in partnership with GFM and provide financial support to enable us to continue to provide training and entertainment for our Multi Cultural community. We continue to seek funds for a worker for GFM who will look for funding and actively promote Gloucester FM to local business. This we feel will help GFM to become more self -sufficient and not rely on grants to be able broadcast. A studio engineer is also required to be on hand to provide technical help and guidance whenever necessary, our supplier is too far away when there is a crisis, and someone to be dedicated with the responsibly of maintaining the IT equipment. These areas along with raising funds for more training and broadcasts are our main objectives at present. The running of GFM has become a full time job therefore we must find the right people to join the GFM family to fulfil the roles mentioned. We will endeavour to make contact with colleges in Gloucestershire to try and find students who want to get hands on training, which will help them in their future career development. I’m hopeful with there being a university in Gloucester we will find the relevant people to do the aforementioned. Furthermore, It is imperative we continue to try to widen the choice of music of black origin being played on GFM to enable us to interact with even more of our community. The community has indicated we should consider this; for example Ska / Rock Steady, Funk, Blues, and more Jazz. Therefore we will actively encourage people to come forward to help GFM serve more of the community by helping to deliver the music being requested. For the month of July we had 126,114 hits on our website, www.gfm.org.uk this is another clear indication the community supports GFM. Last year we had nearly 30,000 almost 100,000 more than last year. We are hoping to broadcast some of the programme contents on the Internet shortly and some shows live and provide the community with music, news, information and advice whilst we’re off the radio airwaves. Thus keeping in touch with the community who can also email us. Remember, “ GFM with the people for the people, serving the community”.